The history of anatomical models dates back to the mid 18th Century. In the early days they where made of wax. Italy, especially Bologna and Florence, was the centre of the wax technique and supplied models to all parts of Europa. But it was a costly method and the models where fragile. In the early 19th Century a new material, papier maché saw the light of day. produce models of the new material. Others, like the well known Louis Thomas Auzoux, followed. Later in the 19th Century other materials, like plaster, where used and production spread to Germany and other countries. In the early 20th Century massproduction started and the models lost thereafter for ever their individual look. The very best of the 19th C models are like pieces of art, the hand skills and the artistic expression is still there! Dont miss the Reference Litterature list at the end of this page! The World Of Auzoux. Models of Man and Beast in papier-maché. Encyclopaedia Anatomica. Museo La Specola Florence. Taschen Verlag. 1999. 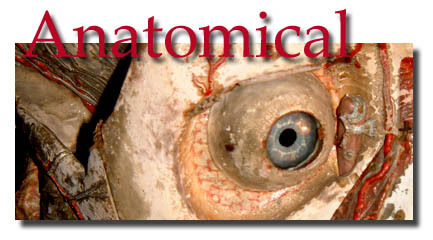 The largest collection of 18th C Anatomical wax models in the world.